We are pleased to announce the launch of SME Club and its first Get-Together, which will be held on 31st March (Thursday), 4.30pm – 7.30pm, at Windmill Restaurant, No 10-11 Jalan SS12/1B, Subang Jaya. The SME Club is a platform for the members of SME Association Malaysia and SMERA Award winners to come together for networking and exchange of ideas. On top of that, we will invite speaker to talk about hot topics and issues relevant to SMEs. For the launch and first get-together, we have invited Datuk Jayasiri from MITI to talk about “TPPA: The Opportunities and Challenges for SMEs. Datuk Jayasiri is the chief negotiator for TPPA. He will share his insights on how SMEs could prepare themselves for the new era of TPPA. You can also meet old and new friends and share latest info about businesses at the get-together. Don’t miss the opportunity to expand your network and get insights on TPPA. 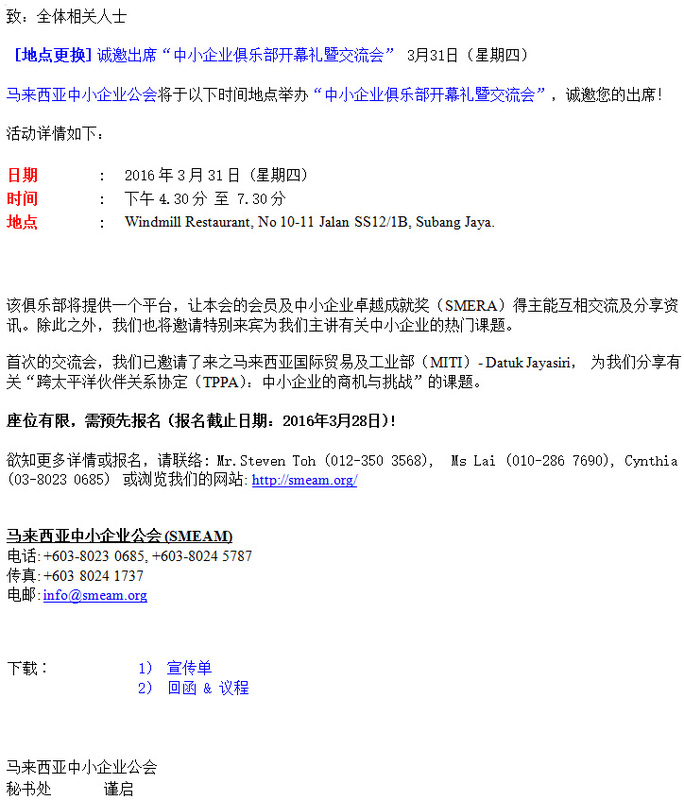 Please refer to the leaflet for registration and details about the event.